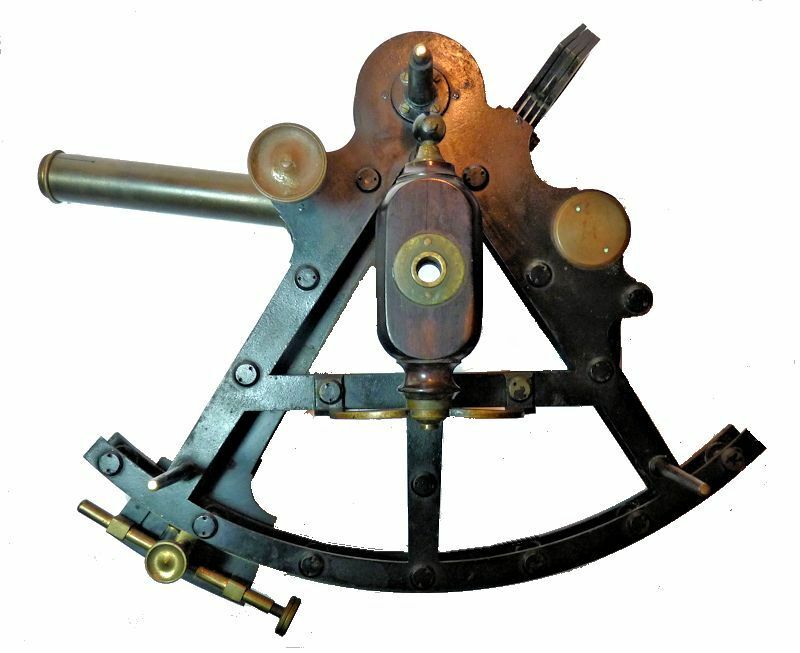 To view our current inventory of high quality antique navigation instruments, click here! This Fine Instrument Has Been Sold. 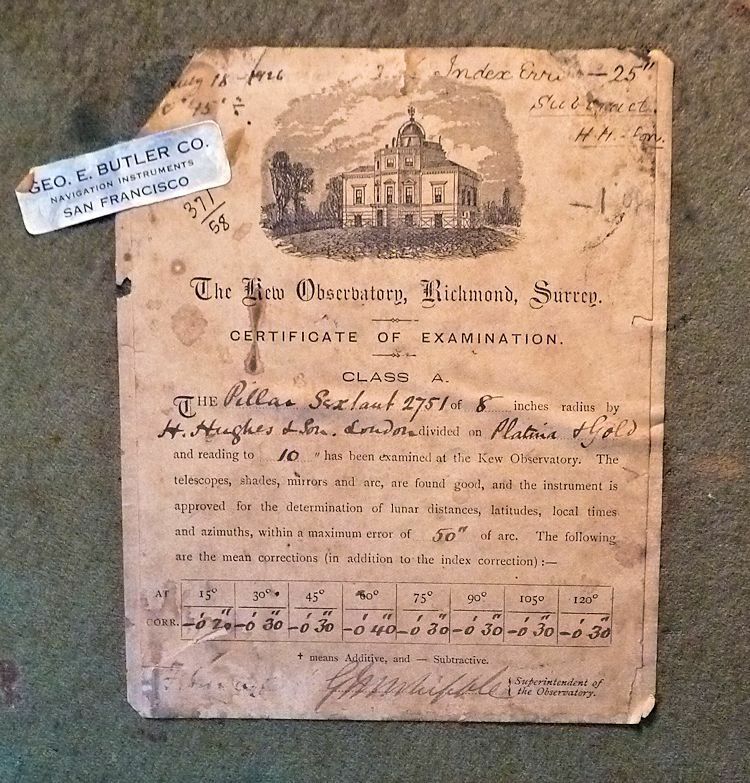 MARKED HENRY HUGHES & SON! 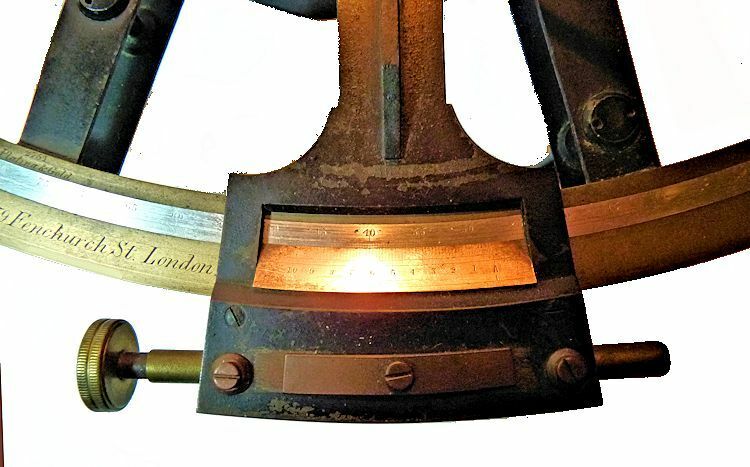 PRESENTED is a rare double frame quintant or sextant that we believe was made by Troughton & Simms - London, the patent holder of this design since 1788, because it is exactly the same as those made by them except for the platinum arc. 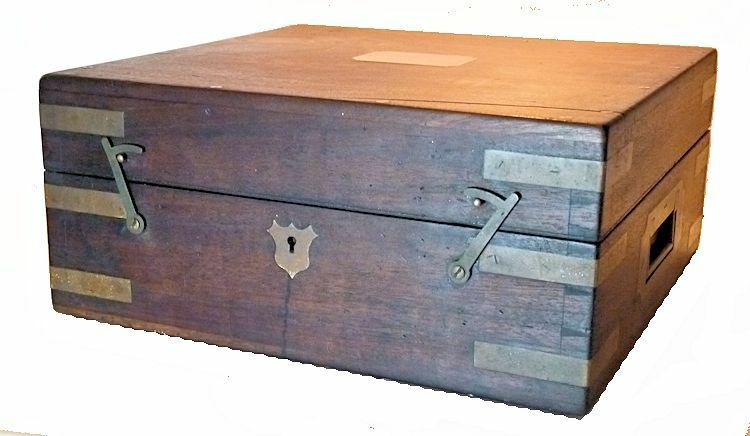 It has survived all these years in its original hardwood, brass strapped case with campaign hardware, and carries its factory painted midnight black coating. The serial number 2751 is on its center limb. Beneath it, on its lower limb, it is marked, "Henry Hughes & Son, 59 Frenchurch St., London" which is the name of the instrument maker and dealer for whom we believe it was made. 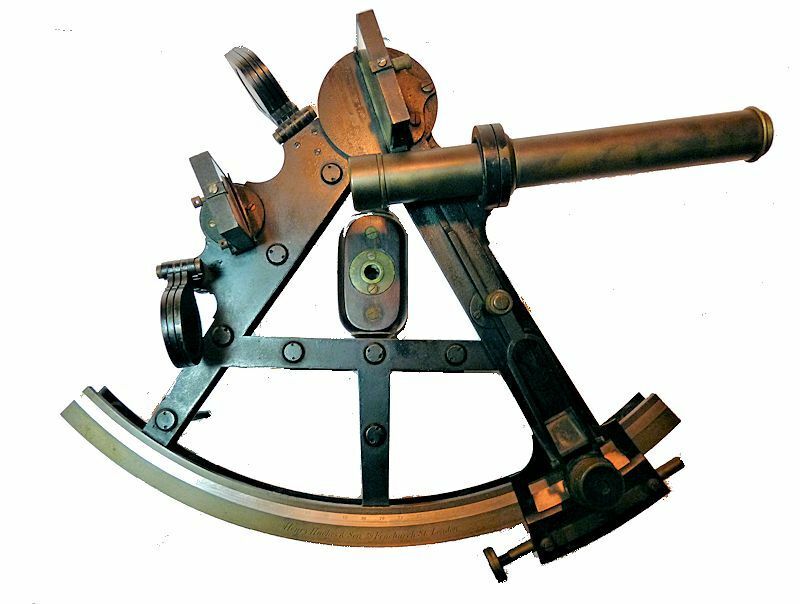 The instrument's ebony handle has a threaded brass insert which was used to mount the instrument on a horizontal plane to take bearing angles of terrestrial objects. It is in a square case whose exterior was coated with years of grime, and was cleaned to its present, as near new condition. There is a fresh brass plaque on the cover of the case. The two original brass sighting tubes and two telescopes with front and rear optics were left "as found". The arc is brass with a platinum insert for the gradations and is marked "Platima & Gold", 2751 above the 75 degree mark. Edward Troughton was the inventor of this design and patented it in 1788, with other makers copying his design, so it is possible that the Hughes firm is the actual maker. The instrument's arc is graduated into 155 degrees which classifies it as a Quintant. 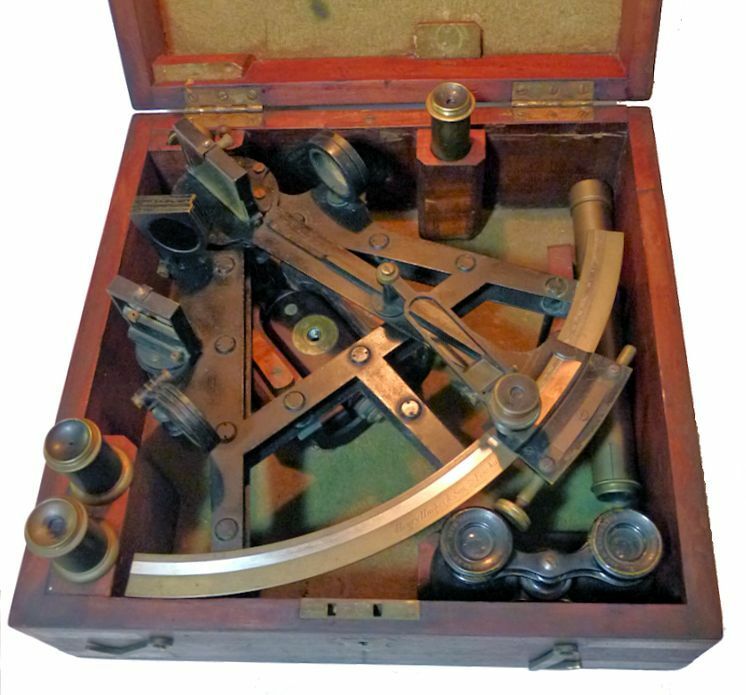 Brass became the accepted material of choice for sighting instruments in the later 19th Century because of its strength and durability. The double frame design was expensive to make and never gained the popularity of the more common single, cast-frame instruments. Consequently, there are few that come to market. Double frame instruments look spectacular so they make an ideal gift and a wonderful reminder of navigation in the the 19th Century. 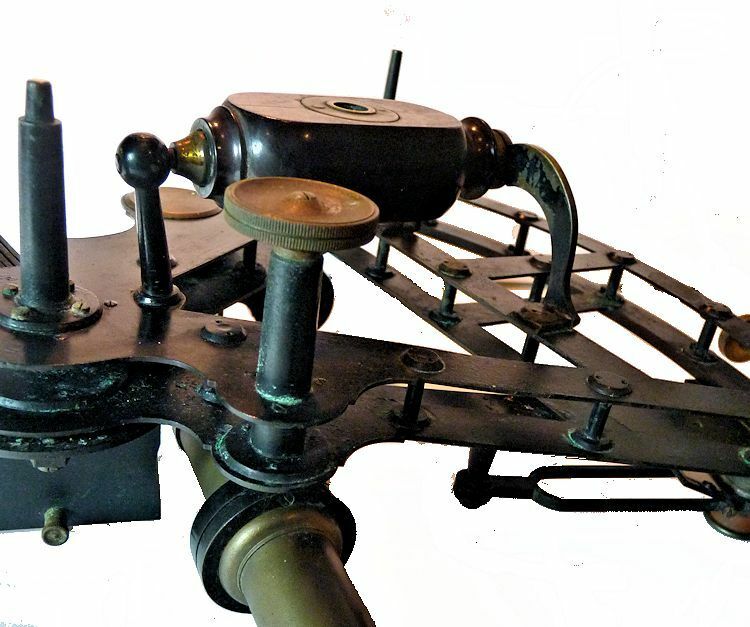 As pictured above, the back of the sextant shows the two straight bar pillar frames that are held together with twenty one pillars, and their screw fittings. There is a turned Rosewood handle with threaded brass insert for mounting the instrument when taking bearing angles. The tangent screw and clamping screw are positioned on the back of the index arm. The device has four square index shades, and three round horizon shades. The telescopes are attached to a perpendicular rising-piece which is adjusted in and out by a milled knob. 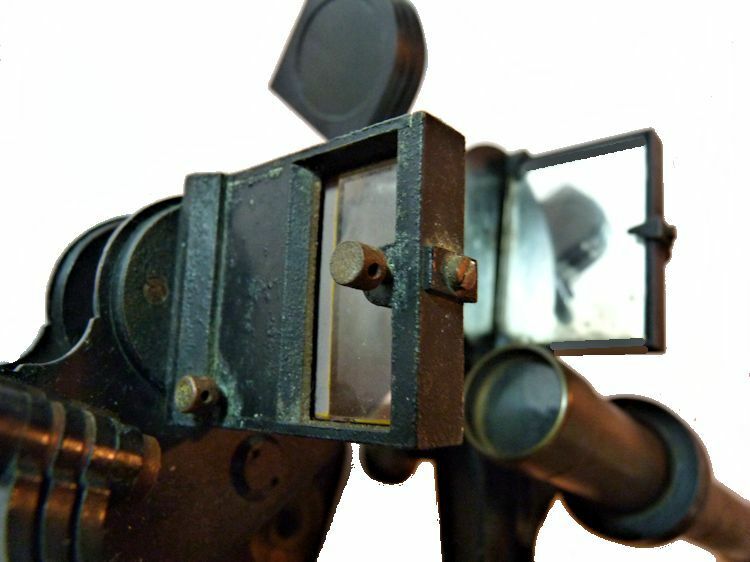 There is also a focusing magnifier traveling over the vernier. The brass limb is inlaid with a tarnish free platinum scale from -5° to 155° divided each 5 degrees. The platinum vernier measures from right to left from 0 to 10° in arc seconds. 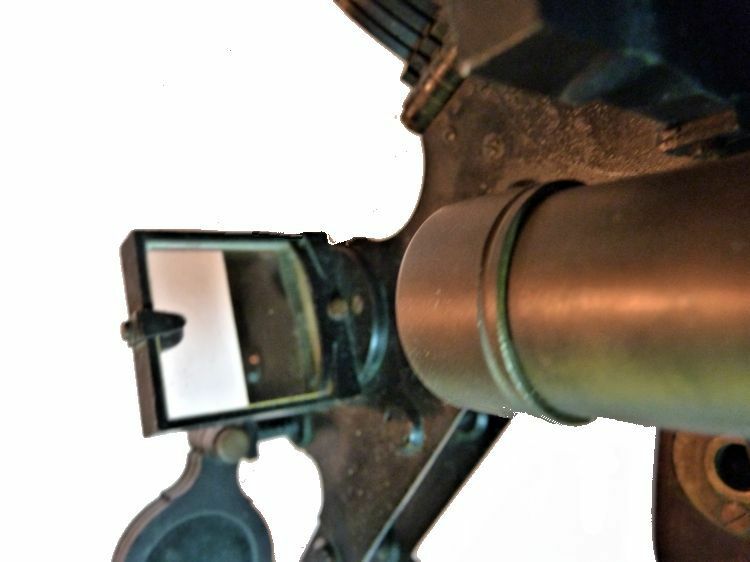 The picture above shows the adjustable rising piece with the knurled knob at the bottom which allowed for the telescope to be moved toward or away from the frame, thereby increasing the visibility of the horizon. This is a an extremely rare and very fine example of a double frame, pillar presentation grade instrument made by one of England's most prestigious Class A instrument makers! INSTRUMENT & CASE CONDITION: One telescope is a pure sighting tube for terrestrial objects. The longest scope with optics has cross hairs that displays the object upside down which was ideal for astronomical use. The short scope with optics, does not focus properly, but displays the image right side up. There is one other scope that is unpolished with optics that does not focus. Both mirrors, considering their age, are in very good condition. The swing arm magnifier is complete and in good working order. Both sets of shades, i.e., filters are in perfect condition. The endless tangent screw turns easily. The small screw driver is missing and the adjusting wrench for the mirrors is present. There is no key. The square, brass strapped case with campaign handles is in excellent condition and the varnish has been cleansed from years of grime. There are four pockets on the right side and only one end lens caps is present. In 1795 he delivered the Troughton Equatorial Telescope to the Armagh Observatory, a 2 inch aperture refractor telescope mounted equatorially, and its first major instrument since its founding in 1790 (It survived into the 21st century also). He created the Groombridge Transit Circle in 1806, which Stephen Groombridge used to compile his star cataloger. He did not merely build instruments, but designed and invented new ones such as his double frame instrument of 1788. Length of index arm 10 1/8"
Radius of arc 9 1/4"
CASE: 11" x 11" x 8" Total weight 11 lbs 4 oz.